Matt Fraction's use of technology in The Invincible Iron Man #31 and The Invincible Iron Man #30 has been very current in regards to real world applications...literally. 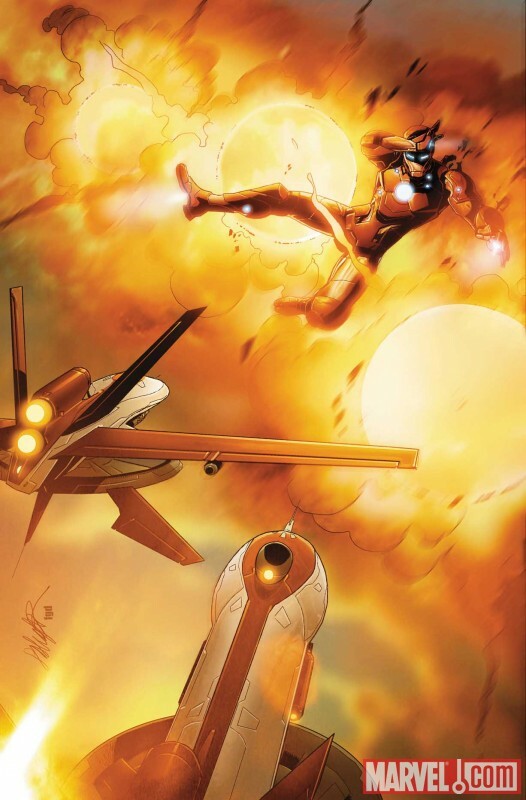 Not only does the comic of the day's arc include the creation of a car that does not run on gasoline or other forms of environmentally harmful substances, but The Invincible Iron Man #31 also includes the use of cell phone applications, or apps as they are called for short. The apps in Iron Man are made by the Hammer Industries, a competing tech company which is always out to get Tony Stark, and designed to have online users control deadly predator drones to destroy targets Hammer Industries wants destroyed. It's a free application which can be downloaded on a smart phone such as an iPhone. The app seems like just a game to the user: a military like game where you must control a drone to destroy a target, but the app is actually a way to have anonymous people unknowingly commit crimes and blow stuff up...namely Tony Stark. People with smart phones, and phones which can play games, are crazy for their apps. One application in real life, Angry Birds, has become so popular there is talk about it being turned into a movie. I hope the producers can get Leo. It is good that they are staying on top of technology. Stark should always be like 10 steps ahead though.